Mega Job Mela In Hyderabad…!!! that the representatives of the Jawaharlal Nehru Technological University, Hyderabad planned to conduct the Mega Job Mela 2019 For Graduates on 23rd February 2019 at UIIC, JNTUH Campus. So, candidates who have the passion to work in the IT Industry must and should focus on this page. And also, through this Mega Job Mela In Hyderabad, many companies are hiring suitable ones. So, check the below given details. Furthermore, unemployed Graduates who passed out their degrees during the year 2016, 2017 and 2018 belonging to Any Graduate, Any Post Graduates, Diploma can register for the Job Mela on or before 21st February 2019 (5:00 pm) by following the link free of cost. The registration closes soon. So, get alert for this notification. 1.5 How To Apply For Off Campus In Hyderabad? Name of the University Jawaharlal Nehru Technological University, Hyderabad. Venue University-Industry Interaction Centre, JNTUH Campus, Kukatpally, Hyderabad. Students & Unemployed Graduates of Any Graduate, Any Post Graduates, Diploma. Candidates who have good communication skill can also attend the Mega Job Mela 2019. Freshers, as well as the candidates who have 2, 3 years of experience, can directly attend by applying. 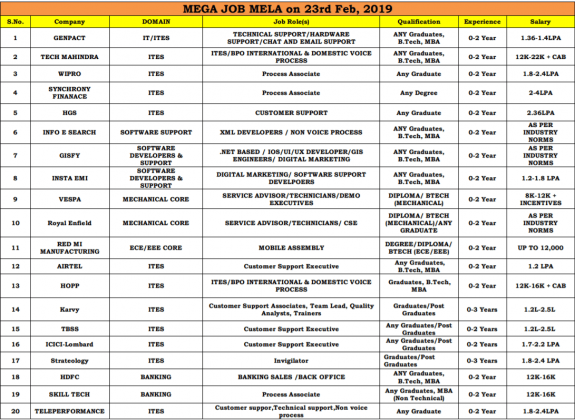 Candidates who are going to attend the Mega Job Mela 2019 For Graduates must and should notify the below listed documents. So that you can know what documents are a must for the drive. Candidates should carry 3 sets of latest Resumes. And also, it is better to take out the Degree Certificates and their copies. Moreover, you should carry any Identity Proof like the Aadhar Card, PAN Card, Voter ID, Any Gazetted officer, Ration Card. How To Apply For Off Campus In Hyderabad? Unemployed Graduates who are waiting to attend the Off Campus In Hyderabad must and should check this section to apply for it. Moreover, we have inserted the direct link to the end of this page. So, by checking that link you can easily apply and attend that on the scheduled date that is 23rd February 2019. You can even move to the official site of the Jawaharlal Nehru Technological University, Hyderabad @ jntuh.ac.in to apply and to know further details. Candidates who have referred to this page must and should notify the given information about the Mega Job Mela 2019 In Hyderabad. So, with that notice, you all can easily apply for it. Thus, to get all such notifications you should follow us on our Freshers Now page.